FABRICA are extremely proud to have been highly commended for two developments at this year's highly coveted Evening Standard New Homes awards. The Chroma Buildings was highly commended for Best Apartment whilst Elmsbrook was highly commended for the Eco-Living award, announced at the prestigious event hosted at London's Dorchester Hotel on 20th May 2016. Across 13 categories and celebrating their 25th anniversary, the awards embrace the architectural ambitions of the full spectrum of new build properties. Covering the full range of apartments, from penthouses to factory lofts, heritage conversions or school redevelopments and everything in between, the penthouse at The Chroma Buildings celebrates the success of a truly skilfully produced home at its best. Occupying the entire top floor, the triple aspect three bedroom 1,347 sq ft penthouse was recognised by the judges for its well-considered design, which reflects the site's heritage as a former photographic warehouse and its outstanding views of The Shard and The London Eye from a vast wraparound private terrace. Inside, higher than average ceilings create an uplifting sense of space whilst concepts of ‘framing’ and ‘aperture’ are incorporated through the use of special design features, from feature joinery pieces to dark wood framed doors and architraves to create a real sense of something unique. Elmsbrook at North West Bicester is the UK’s first eco-town and came highly commended in the Eco-Living category, recognised for its ‘green’ homes which surpass industry targets in terms of energy efficiency, recycling and sustainability, along with its sustainable transport features. 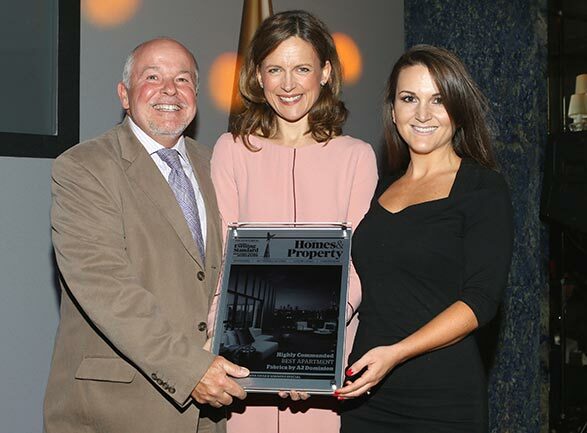 The Evening Standard New Homes Awards are held annually to celebrate the best of the new homes industry. Judging is independent, decided by a panel of property experts and Evening Standard readers with recent buying experience.